Rolled fondant is a common choice for wedding cakes and offers couples a way to achieve a "picture-perfect" cake. The rolled fondant look is appealing and found in many wedding cake catalogs, magazines, and websites. There are a few pros and cons to consider before choosing this wedding cake design. Fondant is a frosting has a texture resembling malleable dough. Made from either a cooked sugar recipe or a simple marshmallow recipe, it is a favorite for decorators and clients who want to achieve a smooth, satiny finish to their cake. Couples who are trying to decide between buttercream versus fondant frostings should keep in mind that most rolled fondant cakes use buttercream as the crumb coat. Usually one-quarter inch thick, this coat helps the rolled fondant adhere to the cake. Flavor can be somewhat "off"
To counter some of the issues with fondant, some couples choose to do a small-tiered cake with fondant frosting and then serve guests buttercream-frosted wedding sheet cake. A rolled fondant frosted wedding cake is usually the first step in creating intricate designs using fondant, gumpaste, and molded chocolate figures. The fondant provides a smooth, clean background for the rest of the design elements to sit. Cake tiers are covered in the rolled fondant and then the decorator works on adding all the design elements to the fondant canvas. If you find making fondant recipes yourself to be too challenging, you can use premade fondant to cut down on labor. Sugarcraft offers a variety of premade fondant ready for rolling, including the popular Wilton wedding cake brand. Couples who want intricate, creative wedding cakes often use fondant as their icing of choice, due to its flexible nature. 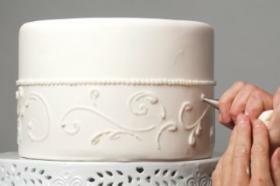 Fondant creates a perfectly smooth base for simple, sophisticated designs, too. 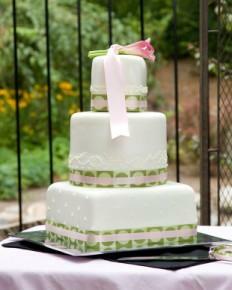 When looking for a wedding baker, ask to view wedding cake photos in his or her portfolio that use rolled fondant. An experienced decorator can turn your dream cake design into reality using fondant.